INDIANAPOLIS – Citizens Energy Group announced today a detour for the Canal Tow Path which will be closed south of Interstate 65 to 30th Street from March 2 until December 2018 for construction of a new water intake at 3400 White River Parkway Drive. 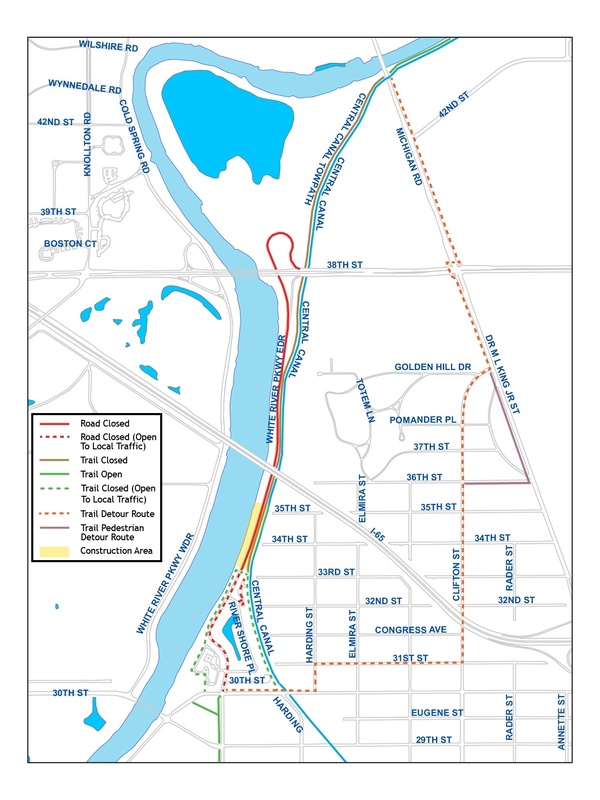 Cyclists and others using the tow path in this area will be directed to detour around the construction via sidewalks along Michigan Road and Dr. Martin Luther King Streets and then on other city streets (see map). The White River intake construction recently restricted through traffic on White River Parkway East Drive until December 2018 and has impacted parking at Fairbanks Park until April 2018. “We appreciate the patience of those who enjoy using the Canal Tow Path as we complete this important project to ensure reliable water supply for the people of Indianapolis,” said Jeff Willman, Vice President, Water Operations. Citizens is constructing the water intake to allow 70 million gallons of water per day (MGD) to be transferred from the White River to the Central Canal for use at Citizens’ White River Treatment Plant. This new intake will be used to supplement water supply to the canal during dry weather and provide an additional supply source for the canal.